The various scale-up methods include roller bottles with micro carrier beads for adherent cell cultures and spinner flasks for suspension cultures . 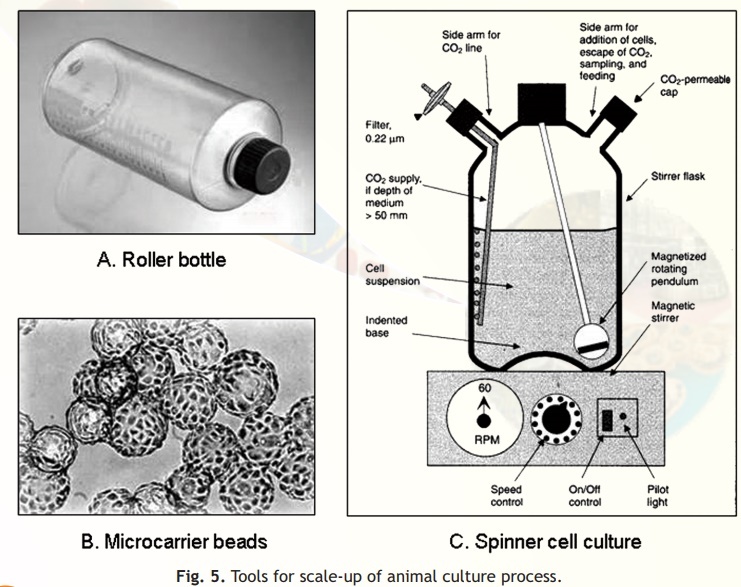 The various scale-up methods include roller bottles with micro carrier beads for adherent cell cultures and spinner flasks for suspension cultures (Fig. 5). In roller bottles, the cells adhere to the total curved surface area of the micro carrier beads, thereby markedly increasing the available space for growth. These tissue culture bottles can be used in specialized CO2 incubators with attachments that rotate the bottles along the long axis. After each complete rotation of the bottle, the entire cell monolayer has transiently been exposed to the medium. The volume of medium need only be sufficient to provide a shallow covering over the monolayer (Fig. 5A). These beads are used to increase the number of adherent cells per flask and are either dextran or glass-based and come in a range of densities and sizes. The beads are buoyant and therefore, can be used with spinner culture flasks. The surface area available for cell growth on these beads is huge (Fig. 5B). Microcarrier beads when re-suspended at the recommended concentration provide an area of 0.24 m2 for every 100 ml of culture flasks. Under these conditions, adherent cells can be grown to very high densities before crowding becomes a problem. Cells growing at such high densities will rapidly exhaust the medium, which may need replacing the medium during culture. Spinner cultures are used for scaling up the production of suspension cells. They consist of a flat surface glass flask with a suspended central teflon paddle that turns and agitates the medium when placed on a magnetic stirrer. Commercial versions incorporate one or more side arms for sampling and/or decantation. The cells are not allowed to settle to the bottom of the flask and thus cell crowding occurs only at very high densities. Stirring the medium improves gas exchange (Fig. 5C). Fig. 5. Tools for scale-up of animal culture process.